Jan. 20 (UPI) — Roger Federer’s attempt at a record third consecutive Australian Open title fell short Sunday in a shocking upset. Greece’s Stefanos Tsitsipas picked up a surprising victory over third-seeded Federer in the fourth round at Rod Laver Arena in Melbourne. Tsitsipas edged Federer 6-7 (11), 7-6 (3), 7-5, 7-6 (5) in a back-and-forth contest. The 20-year-old Tsitsipas became the first player from Greece to reach a major quarterfinal. Federer, 37, was the oldest player left in the field, while Tsitsipas was the youngest remaining in the fourth round. 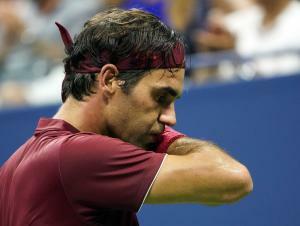 Federer’s loss makes it four straight Grand Slams without an appearance in the semifinals. He sat out the 2018 French Open and suffered defeats at Wimbledon (quarterfinals) and the U.S. Open (fourth round). In other men’s action, Roberto Bautista Agut upset No. 6 Marin Cilic 6-7 (6), 6-3, 6-2, 4-6, 6-4 to reach his first major quarterfinal. Bautista Agut faces Tsitsipas in the next round. On the women’s side of the tournament, unseeded Anastasia Pavlyuchenkova shocked fifth-seeded Sloane Stephens in three sets. Stephens had her best Aussie Open in five years, but suffered a 6-7 (3), 6-3, 6-3 loss to Pavlyuchenkova. Stephens won the 2017 U.S. Open and was the runner-up in the 2018 French Open, but struggled at Melbourne Park in recent years. Until this year, she failed to nab a win in the Australian Open since 2014, which also ended in a loss in the fourth round. Pavlyuchenkova faces unseeded Danielle Collins in the quarterfinals.